Dollar suffers new round of selling in early US session after Trump confirmed his intention to escalate trade war with the EU with his tweet. DOW opens sharply lower and is down -190pts at the time of writing. US 10-year yield also suffers as investors turn cautious again, breaking through 2.5 handle. Germany 10-year yield also turns negative again. Sterling is the second weakest but again staying in range as markets await more Brexit developments. Yen is the strongest one for now, followed by Australian Dollar. Technically, EUR/USD finally breaks 1.1273 minor resistance to indicate short term bottoming. Further rise is now in favor back to 1.1448 resistance. USD/JPY also breaks 111.18 minor support, which suggests short term topping. Deeper fall could be seen to 109.71 support and possibly below. 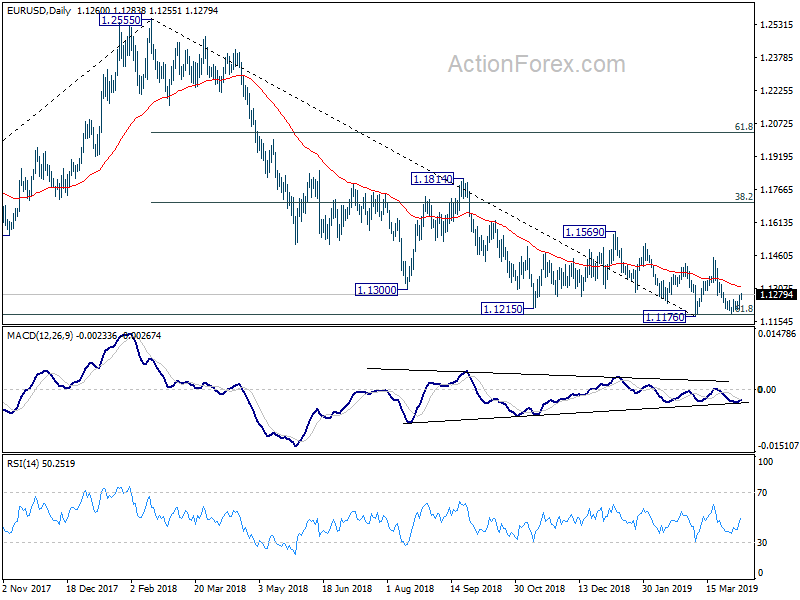 While AUD/USD is a strong one, it’s limited well below 0.7168 resistance though. And upside could be capped if risk-off mode is turned on during the US session. In Europe, currently, FTSE is down -0.21%. DAX is down -0.65%, CAC is down -0.34%. German 10-year yield is down -0.017 at -0.006. Earlier in Asia, Nikkei rose 0.19%. Hong Kong HSI rose 0.27%. China Shanghai SSE dropped -0.16%. Singapore Strait Times rose 0.3%. Japan 10-year JGB yield rose 0.0015 to -0.044. UK Prime Minister Theresa May meets German Chancellor Angela Merkel in Berlin and will fly to Paris for French President Emmanuel Macron later in the day. May is expected to seek backing from the two leaders on her request for article 50 extension till June 30. Meanwhile, it’s reported that there is growing preference in EU for a longer extension till December 31, 2019 or even March 2020. But even so, UK will be required to give specific plan attached to the extension. And as EU chief Brexit negotiator Michel Barnier told reporters, “the duration of an extension has got to be in line with or linked to the purpose of such an extension, and that is something I can imagine Mrs May will be telling the leaders tomorrow as well”. Trump confirmed his intention to escalate tariff war with EU. In a tweet, he echoed the US Trade Representative statement that WTO found EU subsidies to Airbus has “adversely impacted” the US. He also blamed that “EU has taken advantage of the U.S. on trade for many years.” And the US will “now put tariffs on $11 billions of EU products”. In a statement published yesterday, US Trade Representative said WTO repeated found that EU subsidies to Airbus have “caused adverse effects” to the US, with harm in USD 11B in trade each year. USTR has begun Section 301 process to identify EU products to tariff, until EU removes Airbus subsidies. A preliminary list of products are identified for public comment. The list includes products ranging from large commercial aircraft and parts to dairy products and wine, from helicopters to some motorcycles. Airbus spokesman Rainer Ohler criticized the US has “no legal basis” take action against EU on its subsidies. “Necessary measures” has been take to comply with “relatively minor elements” following the May 2018 WTO report. Additionally, Ohler said the USD 11B amount the US claimed was :”largely exaggerated” and should be “defined by the WTO”, not the US. Daily Pivots: (S1) 1.1222; (P) 1.1249; (R1) 1.1287; More…..
EUR/USD’s rebound from 1.1183 extends today. Break of 1.1273 minor resistance suggests short term bottoming at 1.1183, just ahead of 1.1176 low. Intraday bias is now on the upside for 55 day EMA (now at 1.1311) first. Break will target 1.1448 resistance next. For now, we’d expect strong resistance between 1.1448/1569 to limit upside. 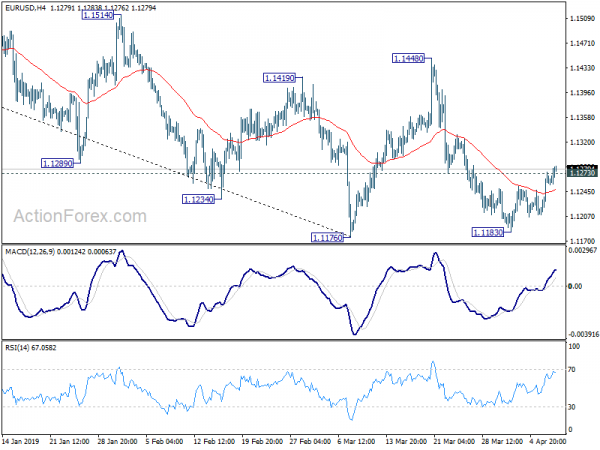 On the downside, decisive break of 1.1176 will resume the down trend from 1.2555.